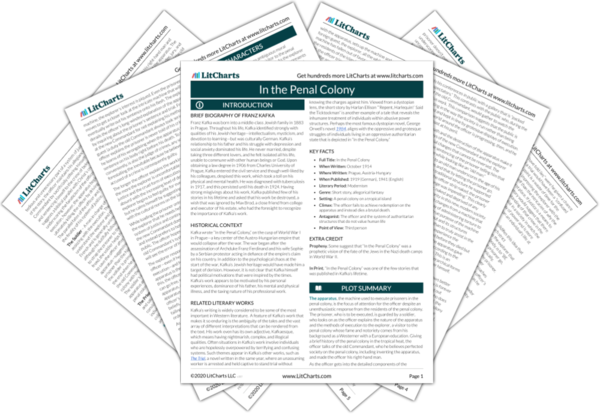 Instant downloads of all 942 LitChart PDFs (including In the Penal Colony). 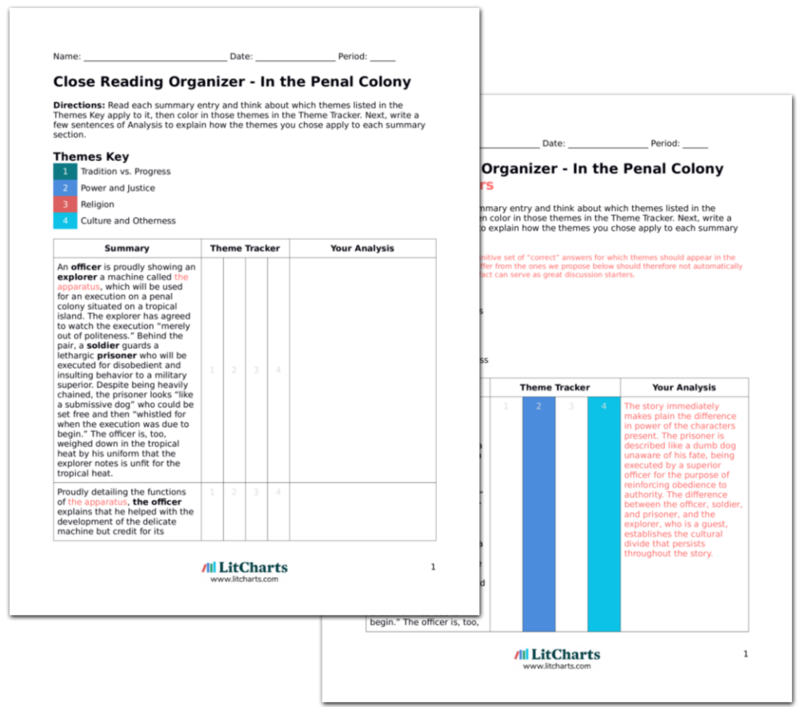 Welcome to the LitCharts study guide on Franz Kafka's In the Penal Colony. Created by the original team behind SparkNotes, LitCharts are the world's best literature guides. A concise biography of Franz Kafka plus historical and literary context for In the Penal Colony. A quick-reference summary: In the Penal Colony on a single page. In-depth summary and analysis of every of In the Penal Colony. Visual theme-tracking, too. Explanations, analysis, and visualizations of In the Penal Colony's themes. In the Penal Colony's important quotes, sortable by theme, character, or . Description, analysis, and timelines for In the Penal Colony's characters. Explanations of In the Penal Colony's symbols, and tracking of where they appear. An interactive data visualization of In the Penal Colony's plot and themes. Franz Kafka was born into a middle-class Jewish family in 1883 in Prague. Throughout his life, Kafka identified strongly with qualities of his Jewish heritage—intellectualism, mysticism, and devotion to learning—but was culturally German. Kafka’s relationship to his father and his struggle with depression and social anxiety dominated his life. He never married, despite taking three different lovers, and he felt isolated all his life, unable to commune with other human beings or God. Upon obtaining a law degree in 1906 from Charles University of Prague, Kafka entered the civil service and though well-liked by his colleagues, despised this work, which took a toll on his physical and mental health. He was diagnosed with tuberculosis in 1917, and this persisted until his death in 1924. Having strong misgivings about his work, Kafka published few of his stories in his lifetime and asked that his work be destroyed, a wish that was ignored by Max Brod, a close friend from college and executor of his estate, who had the foresight to recognize the importance of Kafka’s work. 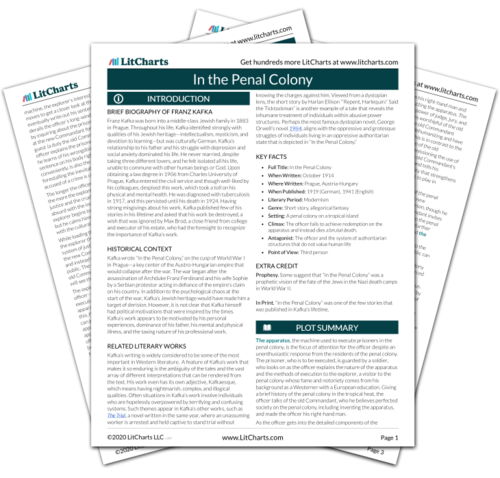 Get the entire In the Penal Colony LitChart as a printable PDF. Kafka wrote “In the Penal Colony,” on the cusp of World War I in Prague—a key center of the Austro-Hungarian empire that would collapse after the war. The war began after the assassination of Archduke Franz Ferdinand and his wife Sophie by a Serbian protestor acting in defiance of the empire’s claim on his country. In addition to the psychological chaos at the start of the war, Kafka’s Jewish heritage would have made him a target of derision. However, it is not clear that Kafka himself had political motivations that were inspired by the times. Kafka’s work appears to be motivated by his personal experiences, dominance of his father, his mental and physical illness, and the taxing nature of his professional work. Climax: The officer fails to achieve redemption on the apparatus and instead dies a brutal death. Prophesy. Some suggest that “In the Penal Colony” was a prophetic vision of the fate of the Jews in the Nazi death camps in World War II. In Print. “In the Penal Colony” was one of the few stories that was published in Kafka’s lifetime. Judy, Mason. "In the Penal Colony." LitCharts. LitCharts LLC, 7 Feb 2019. Web. 21 Apr 2019. Judy, Mason. "In the Penal Colony." LitCharts LLC, February 7, 2019. Retrieved April 21, 2019. https://www.litcharts.com/lit/in-the-penal-colony.